I love trying exotic new places for brunch. Recently, on Cooking Channel’s “Unique Eats,” a small bakery called Sofra located at 1 Belmont Street in Cambridge, Massachusetts was featured. Being that we were headed toward that direction and that the values of the place aligns well with mine (simple, local, and exotic uses of ingredients), I thought it would be a great spot for brunch. We went around 10am on a Sunday morning, the line was just about out the door, and all of the tables inside and out were occupied. We tried to stay out of the way while we decided what to eat. I finally decided to get a small sandwich and some goodies. 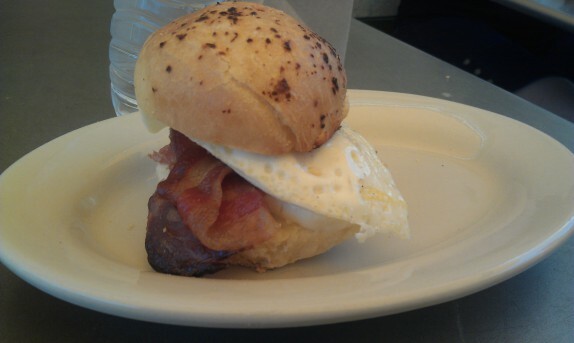 Featured that morning was a small sandwich with bacon, a fried egg, and halloumi cheese. I was eager to try this. Halloumi cheese is a blend of goat and sheeps milk cheese from the middle east that is firm and neutral in flavor. This sandwich was outstanding, but a little small for the $6.99 price tag. I did slowly savor every bite, and thought the firm halloumi cheese was a great, chewy texture to cut through the fat of the bacon and the fluffy, perfectly cooked fried egg. I got a box of goodies that I shared with Cassie. 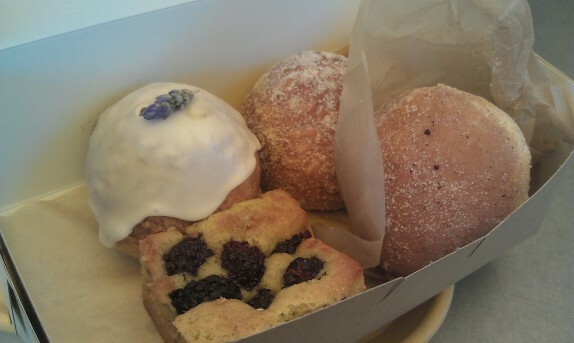 The item on the top left, was a lemon lavender doughnut. This sounded absolutely delicious, but it really wasn’t good. 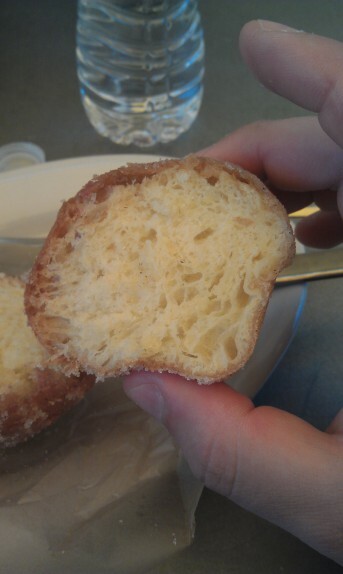 The doughnut and glaze were beautiful and perfect, but the filling was heavy, creamy, and bland. It wasn’t sweet at all, and really brought the rest of the stuff down. Imagine a doughnut filled with unsalted whipped butter. That’s what this was like. 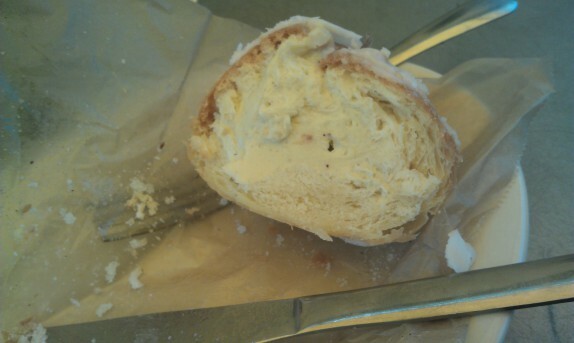 And from the above image, you can see that they very liberally filled the doughnut with this cream. When I removed most of the cream, it wasn’t totally bad; maybe there’s just too much of the cream inside. 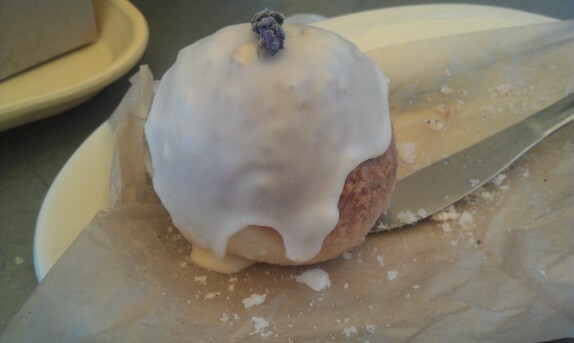 The Persian spice doughnut was a thing of beauty. 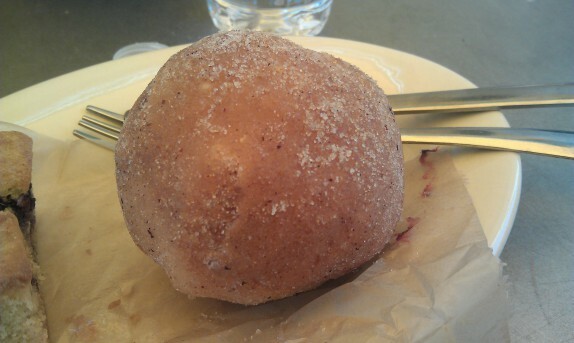 The doughnut itself was light, fluffy, and not too sweet. The sugar and spices coating the outside were nicely applied. I couldn’t tell you all of the spices present, but I definitely tasted black pepper, cardamom, cinnamon, and nutmeg (maybe I just did?). I really enjoyed this, and could easily sit there all day eating them. The size was remarkable. 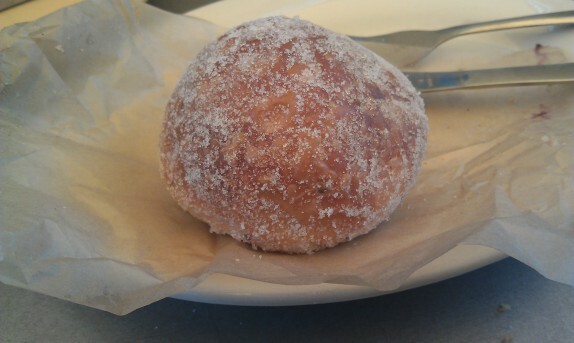 It was larger than a normal doughnut hole but smaller than the average doughnut, for $1.50, which is a reasonable price. I also tried the Moroccan spice doughnut. On first glance, it looked like this was the same as the Persian spice doughnut, but there were spices cooked into the actual dough. In this case, I could see anise seeds, and the sugar dusted around the doughnut contained a completely different blend of spices. Damned it I know what they are, though! This was delicious. Their doughnuts (unfilled) are excellent! There was an olive oil cake on the counter that I just had to try. This was probably my favorite thing that morning. The berries cooked into the cake and exploded ever so slightly. The cake itself was silky and crumbly. You could taste the quality of the olive oil in every bite. 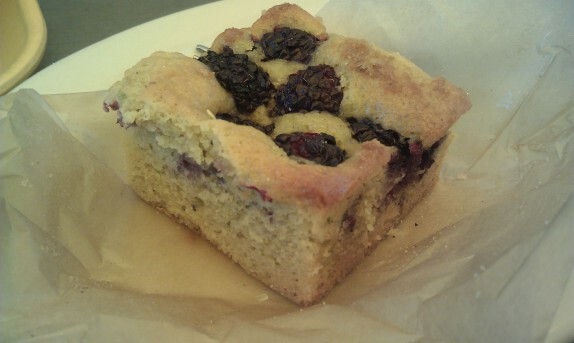 It had just the right amount of sweetness and also had a bit of a savory component, almost like a good corn bread. Cassie had a yogurt parfait that was layered with this thick honey and fig mixture that looked and tasted absolutely delicious. You had to be there! We took a look around their little shop after we ate. They feature a number of homemade chilled and pickled items. 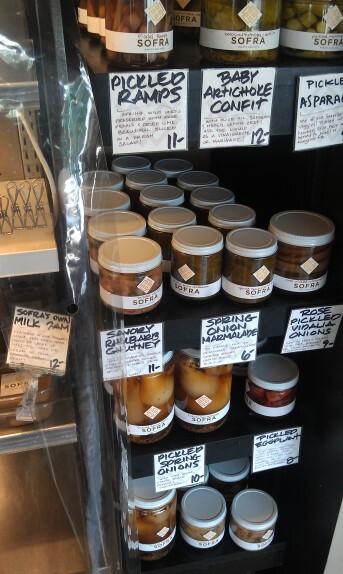 They also have a number of spice blends and dry goods as well as olive oils from all around the middle east. We didn’t buy any of this stuff, but we really wanted to. I really wanted those pickled ramps!